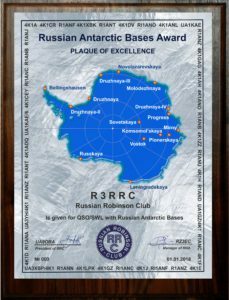 RUSSIAN ANTARCTIC BASES AWARD is issued by RRC (Russian Robinson Club) is called R.A.B.A. The application must be based on the received QSL cards photocopies of which must be sent along with the application to the Award manager (e-mail scan of the QSL cards are accepted). The manager reserves the right to request any specific cards to satisfy any doubt whatsoever. When applying for the Honour Roll Plaque, the original QSL cards have to be sent along with an application. 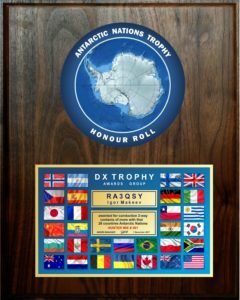 No date, band or mode restriction , only QSOs with Soviet/Russian Antarctic Bases count for the award. Repeated QSO/ SWL with the same callsign from the same base are not allowed. The manager reserves the right to request any specific cards to satisfy any eventual doubt. 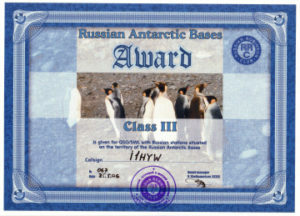 Applications for Awards should be sent to: RZ3EC, Eugene Shelkanovtcev, P.O.Box 70, Orel,302028, Russia. 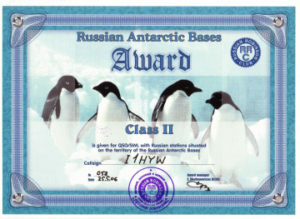 Applications for the plaque should be sent to Award-manager: RU3GN, Victor Rochev, P.O.Box 59, Lipetsk, 398006, Russia. 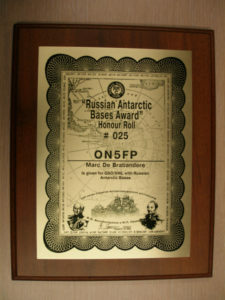 RABA Honour Roll, available with more then 10 different Russian Bases in Antarctica. 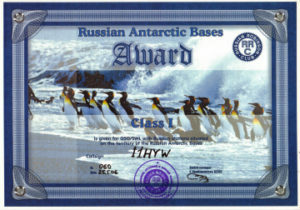 Issued in the year 2008, this is the last Antarctic Award originated by the Russian friends of RRC. Surf the website reported above, to get the information and see other Awards. 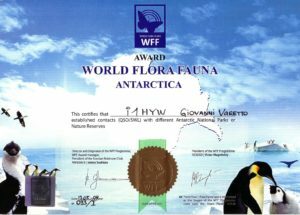 TNX Valery Sushkov RW3GW Director and Originator of the WFF Programme, WFF Award Manager and President of the Russian Robinson Club. To get it, the applicants need to work Bases of various Countries in Antarctica according to the list shown below. The applicants have to send scan QSL cards or screenshots LOTW/Club Log. Upper part of plaque is made by glass, the lower part is metal plate with a size of 250х200.